The holiday season is the perfect time for crafting. With a few basic supplies and a little time, you can make everything from Christmas ornaments to gift toppers. You can even make your own Christmas decorations. Put on some of your favorite Christmas carols, gather the family around the kitchen table, and have fun making these easy crafts this holiday season. This adorable ornament is perfect for your Christmas tree, and it makes a cute gift topper too. This is a quick project and it requires only basic sewing skills. You can expect to complete a mitten in about 20-30 minutes. Start by spreading out your sweater fabric on your work surface. It's best if your sweater is 100% wool and has been washed and dried on hot, causing the wool fibers to shrink. Wool that has been felted in this way won't fray or unravel when you cut it. Folding the sweater fabric in half to create a double layer, cut two free-hand mitten shapes. If you need a guide, you can use a child's mitten as a template. It's nice to keep the sweater cuff as the mitten cuff, but it isn't necessary if that doesn't work with your sweater. Thread your needle with the embroidery floss and tie a knot in the end. Stack the two mitten pieces together, and begin sewing around the outside with a blanket stitch. To create a blanket stitch, simply anchor your thread where you want to begin, and then sew up and over the edge of the fabric to create a loop. Take another stitch about 1/4 inch from the first, but don't pull it tight. Instead, pass your needle through the thread loop as shown in the photo. 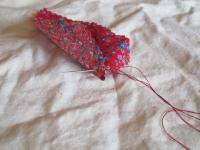 Continue the blanket stitch all the way around the perimeter of the mitten. Leave the cuff open. When you finish stitching or need to add more thread, always tie the current piece of thread off tightly on the reverse side of the mitten. Trim any thread ends to make it neat. Fold over the cuff of the mitten, and choose a button. Take a couple of stitches through the folded cuff. Then leave a loop of embroidery floss that's about five or six inches long. Take several more stitches to keep the loop from loosening. Then add a button to cover you stitches and make the mitten even more charming. 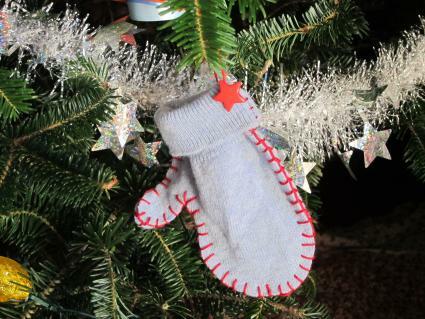 When you're finished, you can trim your thread and hang the mitten on the Christmas tree. 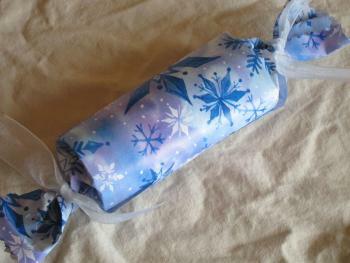 A "popper" is a paper-covered cylindrical package that makes a great Christmas party favor or table decoration. You can create lots of poppers for your Christmas dinner or brunch and place one at each person's plate. Fill the poppers with little treats for all ages. You can expect each popper to take about five minutes. Start by cutting the wrapping paper. You'll need a piece that's approximately eight inches by ten inches, but it doesn't have to be perfect. You can trim it to fit later if you cut it too large. Use pinking shears to give the paper edges a cute zig-zag look. That way, you won't have to worry if they are uneven. Lay the toilet paper tube on top of the wrapping paper rectangle that you cut. Position the toilet paper tube so it is in the middle of the paper rectangle with one of the long sides facing you. Insert the little toys and treats into the tube, being careful not to overfill it. You don't want anything sticking out of either end. Tape one long side of the paper to the tube. Tightly roll the other side around the tube so that it overlaps. Place a piece of double-sided tape or clear tape on the paper to fasten it securely. Check to make sure the tube is in the center of the roll of paper. If it's not, trim the paper on one end to make it even. Being careful not to spill any of the contents, gently twist the paper on one end to seal it. Tie the twist with a piece of ribbon. Then twist the other end in the same way. Trim the ribbons to make them even. Gently flatten the paper ends of the popper to give it an attractive look. If you're hoping to add a homemade touch to your gift wrapping this year, nothing beats a simple calico poinsettia gift topper. Each gift topper will take you about 15 minutes to make. Begin by using your pinking shears to cut a rough petal shape out of the calico. You can make it as large or as small as you want, but you should be sure the end is pointed to give it a characteristic poinsettia shape. Then use that petal as a pattern to cut five more of similar size. Not all of your petals need to be identical, but they should be about the same size and shape. Spread your petals out and set them aside. Take one petal, and fold it in half with the right sides together. Don't crease it, but pinch a small part of it right at the base (the opposite of the pointy end). Thread your needle with a double length of thread, and knot and trim the end. 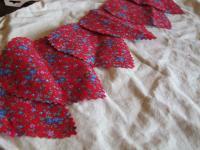 Take a stitch about 1/4 inch into the fold you made in the petal. Sew up and down a few times to secure it. 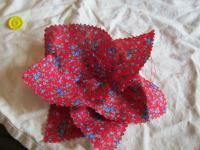 These little folds will ensure that your petals stay shaped just like a real poinsettia. When you're done securing the fold, open the petal, and bring the needle up to the right side of the fabric. Repeat this process with the next petal, and then attach it to the first one. Place the second petal at a slight angle to begin creating the flower shape. Continue making the 1/4-inch fold in each petal and attaching it to the flower at an angle. When you're done, you'll have a completed flower (except for the center). 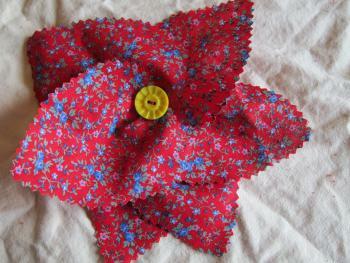 Finally, sew a yellow button in the center of the poinsettia. Choosing a vintage button gives this gift topper a little extra charm, but any yellow button will work. You can sew this gift topper directly to the ribbons you're using on your present, or you can leave long thread tails to tie it on. You can display a Christmas message on top of a bookcase, desk, or countertop or mount your message on a wall. This easy craft lends a high-impact holiday decoration and only takes about 30 minutes to make, plus drying time. 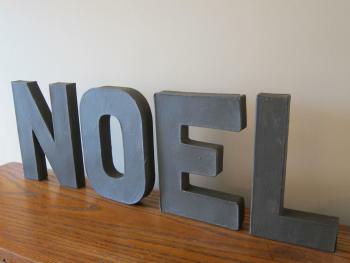 Choose letters to read "Noel," "Joy," "Peace," or another holiday word. Spread newspaper on your work surface to protect it from paint. Pour some of your craft paint into a bowl or open container. Paint the front of each letter. Allow the paint to dry. Flip the letters over and paint the back. When the letters are dry, display them as desired. You can preserve your little one's cute handprint and create a holiday gift or keepsake at the same time with this fun and easy craft. This makes a great Christmas gift for grandparents. Because of the curing time this can take a while, but the hands-on time for this craft is only about 20 minutes. Mix up the plaster of Paris according to the package directions. Pour the mixture into the pie tin. Help the child make a handprint in the mixture. 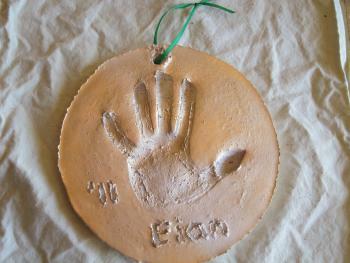 Carve the child's name and the date in the plaster of Paris, and make a hole for attaching the ribbon. Allow the plaster of Paris to cure completely and remove it from the tin. Spray paint the front of the decoration gold or any other color you desire. Thread the ribbon through the hole to make a hanging loop. If you need more ideas or want to purchase a kit that can give you a head-start on your craft project, the Internet is a great resource. You can find thousands of ideas for Christmas crafts no matter what type of craft you like best. Weekend Kits - Here you'll find kits for everything from stockings to tree skirts, as well as ornaments, flags, calendars, and more. Herrschners - This retailer offers kits for wreaths, ornaments, decorations, and gifts. Mary Maxim - With hundreds of kits, ranging from ornaments to large decorations, this site is a great place to find your next project. All Free Crafts - Here you'll find instructions on creating tree trims, potpourri pinecone angels, three-dimensional paper snowmen, and much more. North Pole Christmas - You'll find free Christmas patterns with complete directions, including patterns for making snowmen, Santas, and angels. Better Homes and Gardens - The popular magazine site offers all kinds of craft projects from snowflake ornaments to Christmas dinner centerpieces. Although the holidays can be a hectic season, making time for crafting can add to your Christmas spirit. Whether you're making homemade gifts, decorating your Christmas tree with ornaments you've created by hand, or working with children to make holiday craft projects, you'll find that you're also making special holiday memories as you work.